The organisers of the 12th annual dinner of the Winchester and Portsmouth D.G., which was held at Southampton on April 19, have every reason to be satisfied with the support they received and with the all-round success of the evening's arrangements. The dining room of The Royal Hotel was filled by the 120 members, guests and visitors and the Master (Mr. Kenneth S. B. Croft), who presided ensured that the meal was served on time and that there were no unnecessary delays during the formal proceedings. Following the meal and the toast of H.M. the Queen, a 15 minutes interval was followed by the Master extending a warm welcome to all, especially to the Dean of Winchester (V. Rev. M. S. Stancliffe) and Mrs. Stancliffe. The Dean is Patron of the Guild and his help during last year's Centenary Thanksgiving Service in Winchester Cathedral was much appreciated. The Master then introduced Mr. James G A Prior (hon sec. A.S. College Youths), who was to propose the toast to the Guild. "'The Winchester and Portsmouth D.G. is presently numbered among the leading Guilds and is held in esteem and affection'. How very true that is", he added. "The Guild has never been afraid to give a lead, where necessary, and it has often pioneered paths which others have later followed, to their benefit. "'It is right that we should recall the efforts, not only of the founders, but also of those who through 100 years have served the Guild and the ideals for which it was brought into existence, it is right, too, that we should look ahead and, in so looking, resolve with honesty to further the purposes of the Guild'. "Those apt words summed up the history of the Guild - the founders who worked so hard to establish it - those who built on the foundations so firmly and so surely laid, and the present officers and members who so ably are carrying on the traditions of the Guild. The Guild, like many other ringing organisations, has many able and promising young members and it is to these young members that the Guild must inevitably look for the continuation of its present prosperity. "To them I would say, 'You are members of a Guild of which you have every reason to be proud. To hold office and to work for the good of the Guild is something to which you can and should aspire so that it may retain its honoured place as one of the leading organisations of the Exercise'." Mr. Prior referred to various events which occurred during the Centenary Year, mentioning particularly the weekend in July when the Guild entertained both the College Youths and the Cumberland Youths, three peals being scored with members of both Societies taking part in each. Mr. Lester Bailey (Vice-President), who was a speaker at the dinner, enjoying the company of three ladies before the meal. 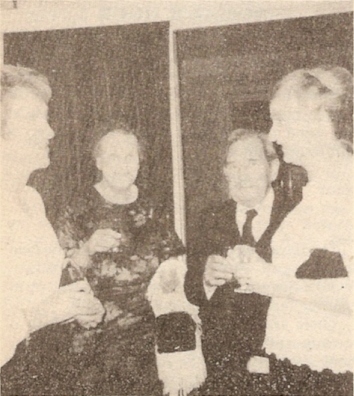 His wife is on his right with Mrs. Stancliffe and (right) Mrs. Madeline Croft (wife of the Guild Master). The 9-bell peals at All Saints, Basingstoke, singles in Surprise methods, unusual method names and the peal rung by six young ladies in bikinis were referred to and caused considerable amusement, as was the suggestion of six (named) members of the male population of the Guild ringing a peal in their underpants! 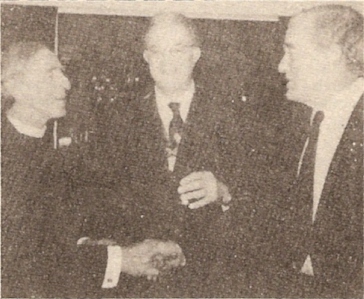 The Guild Master, Kenneth Croft (centre), introduces Jim Prior (r.) to the Dean of Winchester (V. Rev. M. S. Stancliffe). "To have been present at this dinner has been a very real pleasure - to have been entrusted with the toast has been a great privilege and I am most grateful to the Guild," concluded Mr. Prior, who added: "Now, with pride in your hearts for the Guild's past history, with thankfulness for its present vigour and with confidence in its future, will you please be upstanding and drink with enthusiasm the toast of the 'Winchester and Portsmouth Diocesan Guild'." Vice-president of the Isle of Wight District, Mr. Lester Bailey, responded to the toast "with surprise and some trepidation." He was not a College or Cumberland Youth - "I am not ancient enough," said Lester, amidst laughter, although he had spent some time delving into the history of bellringing of 200 and more years past. The associate members of the W & P in its early days far outnumbered the active membership, but the reason for that was in order to raise funds to pay for members' travelling expenses and for teas at Guild meetings. Eventually subscriptions were raised and the Guild became more outward looking. There were in past days ringers who had peculiar habits: Glen Hollis who always wore a top hat when ringing and, another - a farm hand - who never changed his clothes and stank of cow's manure. He also rang one handed and had a Woodbine cigarette in his mouth all the time. The ringers then wore thick clothing at all times, believing that what kept out the cold also kept out the heat - with rather smelly, stifling results [laughter]. However they rang the bells regularly and the Isle of Wight had a pretty good record. Thanking Mr. Prior for his kindly and expressive sentiments, Mr. Bailey felt sure the W & P would continue to be vigorous and prosperous. The toast of "The Visitors" was entrusted to Cdr. William A. Harris, R.N., Chairman of the Alton and Petersfield District, who amused the company with truly naval terms of "keelhauling" and "stringing-up", "yard-arms" and so forth. He particularly welcomed and thanked the Dean of Winchester and his lady; commended Jim Prior for his unending period as hon. secretary of the Ancient Society; and referred to Jim's time in the light blue "junior service" as an RAF navigator in a Swordfish aircraft. Greeting Heather Kippin - a familiar name in the W & P Guild - who was to reply to the toast, Bill Harris warned her husband (Chris) against any barracking, for his father (Chas. H.) had on a previous occasion been severely put in his place by the Chairman of the Winchester District - a lady by the name of Jessie Kippin [laughter and applause]. The Ringing World editor and his wife, Edna Denyer, were welcomed and thanked for their "combined ops", and the Guildford Guild Master (Michael Church) was greeted and also thanked for bringing his wife Lucy "to add to the attractions". "I have no time now to mention all the other visitors for I see 'Ayatollah Croft' has been looking at his watch," quipped the Commander, who then invited the W & P members to drink a bumper toast to the Visitors. Mrs. Heather Kippin, of the Gloucester and Bristol D.A., thanked Cdr. Harris for the kind things he had said about the guests, and in thanking the W & P for their hospitality, said she had received several free teas at striking competitions after doing nothing more strenuous than sit in the churchyard. She had also been wined and dined just for sitting and listening to someone else doing the work! Comdr. 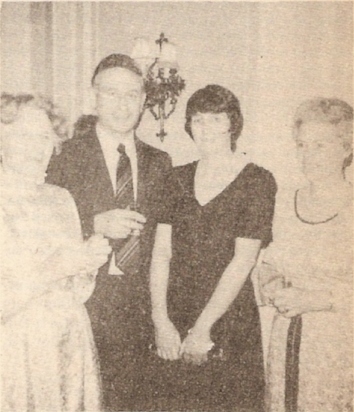 Bill Harris, R.N., with Mrs. Stancliffe (Dean's wife), Mrs. Heather Kippin and Mrs. Molly Harris. "I am not a great believer in Women's Lib. etc., but I must admit to being very pleased when I see ladies' peals published in the Ringing World. We have rung some in Bristol and I always note with interest the achievements of other bands. In Bristol we have never attempted a peal dressed in bikinis. I'm not sure whether it is our age or our figures that has stopped us. "Ladies peals are not new, but they seem to have become much more popular recently. Perhaps this indicates that at last ladies are accepted in the belfry as being equal to men and that they are given opportunities both 'to ring round the back end' and also to call touches, quarters and peals. There is still one field however in which ladies are still far behind. I don't recollect ever seeing a peal composed by a lady (I am told there was one in the 1950's). Why is this so? We are after all just as clever as the men. Perhaps we haven't the patience or is it simply that most of us haven't the time. Anyway I am sure that somewhere in the country there is a lady ringer who either has, or could compose, a peal worthy of publication. Let's hope that we see it rung in the near future." 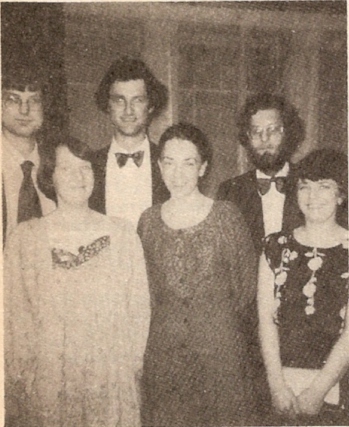 The Croft Brothers, plus … (back) James, William and John, and in front (l. to r.) Jenny Hudson, Hilary Irwin and Roz Bennett. "That was in the days when there was still a floating bridge; the Queen Mary still docked here and you could catch a steam-hauled train at Swaythling station! On reflection to rely on nostalgia is a sure sign of getting old! [Her youthful looks bely this statement- Ed]. It made me consider the various yardsticks by which people measure how old they are getting. One person in our house reckons that when the Master of the College Youths looks young it's a sure sign that you're getting on a bit and recently some of the 'As You Were' photographs in the Ringing World have brought the passing of the years home to me. One was of a gentleman in this room this evening. Not only did I not recognise him, but also I realised that I can remember when he looked like that. That made me feel positively ancient!" [Laughter]. "Thank you again for inviting me; it has made my year even if it hasn't made your evening." Between the speeches there was rung on hand-bells a course of Grandsire Triples by members of the Alton and Petersfield District, namely Bill Harris 1-2, Blanche Hunt 3-4, John Hunt 5-6 and Molly Harris 7-8. The Guild Librarian, Mrs. "Pip" Nabb, had brought along various books and manuscripts for the interest of the company. At the top table were Graham Grant (Captain of the Winchester Cathedral band) and Mrs. Grant. Graham has done a great deal of the design and script work for many Guild features in the past year. For the first time speakers were from the Alton and Petersfield District (Cdr. Bill Harris) and from the Isle ofWight (Lester Bailey). The chief guest (Jim Prior) was first elected to membership of the W & P in 1934 at a meeting on the Isle of Wight at Carisbrooke - proposed by Dr. J. B. Williamson. With the V. Rev. M. S. Stancliffe having come to the Deanery at Winchester from St. Margaret's, Westminster, there was a London-Winchester emphasis this year. It is perhaps worth recalling that for about 200 years members of the College Youths practised in the Diocese of Winchester. Southwark was, until 1879, in the Diocese - the Society had its headquarters in Winchester Square, Southwark, and rang at St. Saviour's, which was not then Southwark Cathedral. The palace of the Bishop of Winchester adjoined St. Saviour's and there is a legend that the first Church on the site was founded in the 7th century by St. Swithun. The palace no longer exists, except for one wall containing a rose window. I like to think that there is a link between the Diocese of Winchester and the Ancient Society - a link that nowadays is continued by the friendship between the Guild and the Society. Many resident members of the Guild are also members of the Society and many members of the Society resident in London are glad to be members of the Guild. Jim Prior at the W & P Guild Dinner.